Kansans have been celebrating Thanksgiving since before statehood. Generally speaking, Thanksgiving in Kansas has been much like that holiday elsewhere, and as early as November 1860 Kansans spoke of observing the day "in accordance with tradition." 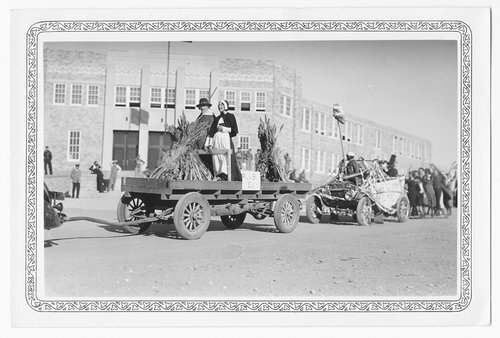 However, in 1939, Kansans were asked to break with tradition when "Franksday" was proposed to them. "Frank" being Franklin D. Roosevelt, president of the United States. In mid-August 1939, apparently at the behest of the National Retail Dry Goods Association, President Roosevelt proclaimed November 23, instead of the last Thursday of that month, that year's day of Thanksgiving. The idea was to provide an extra week for Christmas shopping. To the retailers the early holiday made perfect sense, and they claimed that the president accepted their idea "for one purpose only—to help business to help the unemployed and the general public.... An extra week in which to transact the Christmas business will mean much to every retailer. It will mean much to his employees. It will mean a great deal to the extra people that he employs. It will mean less hustle and confusion to the shopping public. These are human considerations well worthy of inclusion in our giving of thanks." Not everyone recognized or accepted the entrepreneurial logic behind FDR's decision. Or, if they did, they did not believe the arguments were compelling enough to justify a break with "tradition." Since state governors customarily confirmed the presidential proclamation with one of their own to make the holiday official within their respective jurisdictions, the upholders of tradition began petitioning chief executives across the country. In Kansas Governor Payne Ratner immediately came under intense pressure. Some urged him to follow the president's lead, but the vast majority insisted that he follow time-honored custom and go with the last Thursday of the month. Initially, the governor himself was ambivalent. "I'm more interested today in getting this crude oil price problem settled right so we'll have something to be thankful for," he wrote on August 15. "It doesn't make much difference to me whichever day we observe Thanksgiving." Within two weeks, however, Ratner had changed his mind. Encouraged by the actions of several other governors and the entreaties of numerous constituents, the Kansas governor announced that in the Sunflower State "we do not destroy tradition merely to gain newspaper headlines." Besides, people had made plans and scheduled events, such as the Kansas-Missouri football game, with a November 30 Thanksgiving in mind. The Kansas Republican governor was not about to inconvenience fans so that the Democratic president, who had kept "business on a starvation diet considerably lacking in the vitamins of governmental co-operation and encouragement," could now toss them a crumb "in the form of an alleged opportunity to increase Christmas shopping." Buoyed by Kansans who believed "President Roosevelt's announcement smacked of Dictatorship" and that by smashing the Thanksgiving tradition he was angling for "a third term," Ratner remained defiant. Through two more Thanksgivings, Kansas was counted among the official hold outs, while neighboring Missouri celebrated FDR's "early Thanksgivings." In reality, some Kansans took advantage of the controversy and partook of the holiday fare on both days. Prior to the 1941 holiday, however, Roosevelt announced that Thanksgiving 1942 would "fall on the traditional last Thursday of November." In light of the winds of war that swept in within weeks of this announcement, it was a good thing. Americans found things to be thankful for in November 1942, but they were in no mood for a continuation of the "early" or "traditional" Thanksgiving Day quarrel.